The Queen's Side presents the palace in the Georgian era. Because Queen Mary died before the building was completed, decoration of this side of the building was left to the succeeding reigns. However, Mary's sister, Queen Anne, who followed preferred Kensington Palace and so little was done at Hampton Court during her reign. King George I did not like the trappings of royalty and, in any case preferred his native Hanover (Germany). So once again little was done. 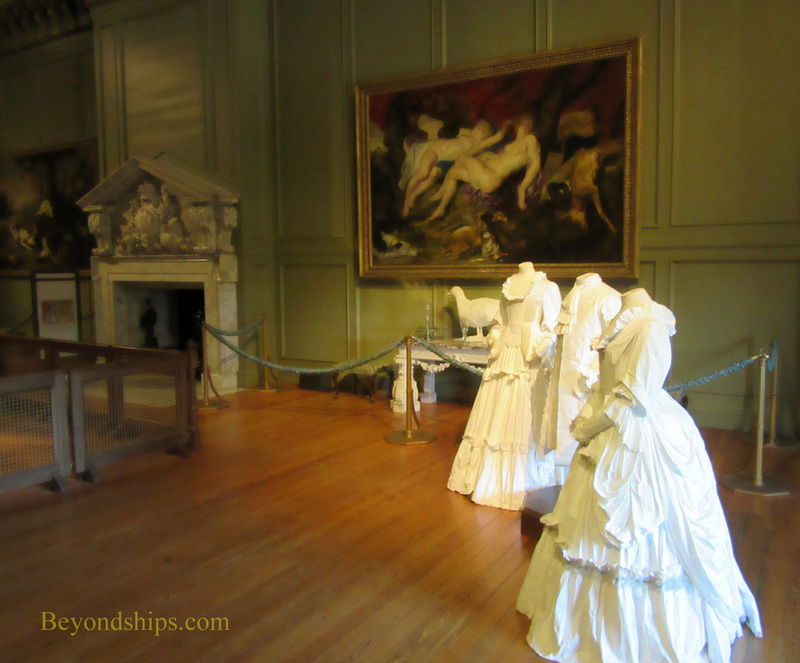 His son and daughter in law, the Prince and Princess of Wales (later George II and Queen Caroline), enjoyed court and took an interest in Hampton Court. Under the supervision of Sir John Vanbrugh, the Queen's Side was completed in sumptuous fashion. 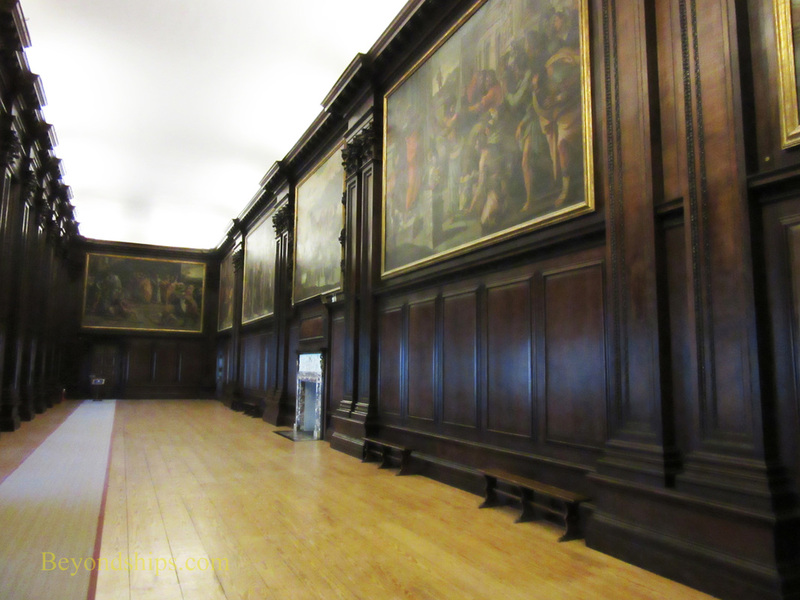 George II also had a suite of rooms built for his second son the Duke of Cumberland. These were designed by William Kent and some have been turned into the Cumberland Art Gallery. There are paintings and works of art throughout the palace. However, the Cumberland presents some real masterpieces from the Royal Collection. The works displayed are changed on a rotating basis. 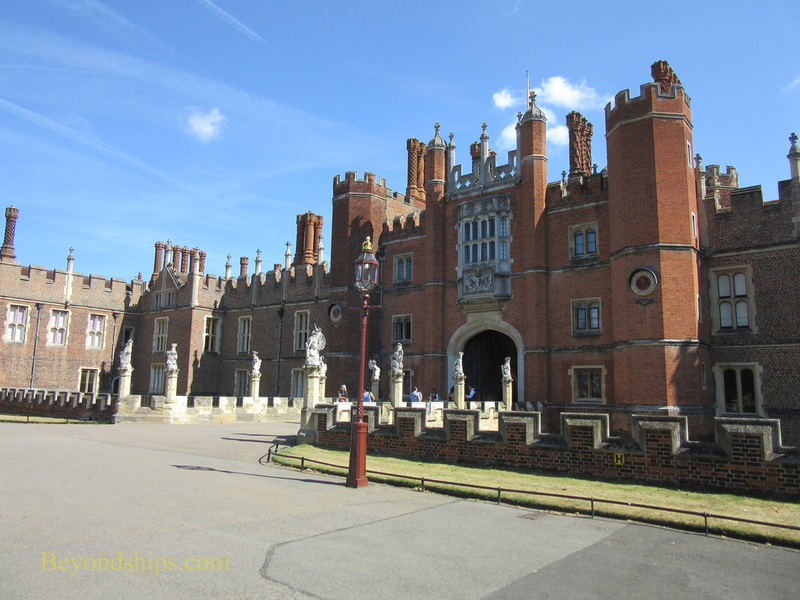 Hampton Court Palace sits in a 750 acre park. Locals often come to Hampton Court just for the park without venturing into the house. The park includes several different types of garden. The Privy Garden is a recreation of the formal French-style garden laid out for William III in 1702. Using the original plant varities, the garden follows the original design. Its elegant layout blends harmoniously with Wren's facade. Nearby is the Great Vine. In 1768, landscape gardener Lancelot “Capability” Brown planted grape vines to supply the palace. The vines still produce grapes (sold in the Palace shops. One of the best known features of the park is the Maze. Planted over 300 years ago, tall yew trees form the walls for winding gravel paths. The object is to get to the center of the puzzle although much of the fun comes from getting lost. Tall yew trees also shade the 580 meter Broad Walk in the Great Fountain Garden. The herbaceous border along Broad Walk is the longest in the world. Originally, there were 13 fountains but today there is only one fountain, which acts as a focal point for the garden. Other features of the park include the Tiltyard where Henry VIII held jousts, the Knot Garden, which is laid out like a garden in Henry's time, the Pond Garden s, which were once ponds used to hold freshwater fish, and the Kitchen Garden, which supplied fruits and vegetables. Also in the grounds are the Royal Tennis Court, where Henry VIII played Real Tennis, William III's Banqueting House and Mary II's Orangery. There is also a Magic Garden with a range of elements for children. 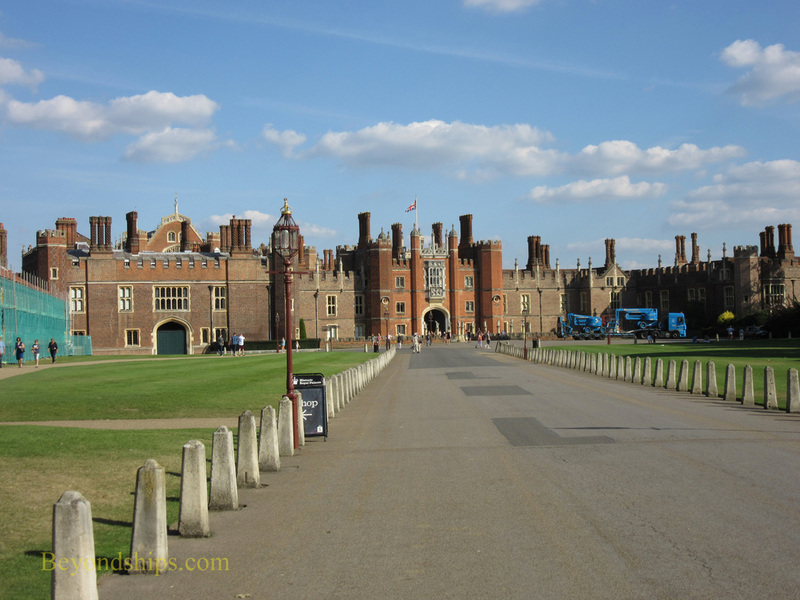 Hampton Court is on the outskirts of London. In Henry VIII's day, the best means of getting to Hampton Court from London was to take a boat on the River Thames, which runs by the palace. There are still tour boats that make this voyage but it can take up to four hours from Westminster. Perhaps the easiest way to get to Hampton Court from Central London is to take the local train from Waterloo Station. Trains leave frequently and the ride is about half an hour. The train station is close to the palace - - just across the road bridge that spans the river. There are entrance fees. Visitors can purchase tickets that provide access to the palace, the maze, and the gardens; to the Maze and the Magic Garden; or just to the Maze. Tickets can be purchased at Hampton Court or online. Hampton Court is open everyday except December 24, 25 and 26. However, certain parts of the gardens are more seasonal and close at other times. For opening hours, see the Historic Royal Palaces' website. Above: The Dining Room with period costumes. Below: The Cartoon Gallery was created to exhibit tapestry designs by Raphael. Above: Gnomes are stationed around the gardens. Push the button on the arm and the gnome dispenses information.